I'm a little bit late, but I wanted to acknowledge something wonderful that happened at the end of September. 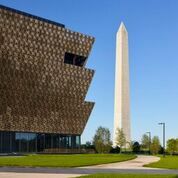 On September 24th, The National Museum of African American History and Culture (NMAAHC) officially opened in Washington, D.C. I had been reading about it for some time and following the building's progress. I was so excited to see it come to fruition. As I watched the dedication ceremony online on September 24th, I was incredibly proud and moved. I thought of my parents and grandparents who are no longer here and I thought of all of my ancestors who laid the path for me. All of the speakers were wonderful and I especially loved hearing President Obama and Congressman John Lewis speak. I have always admired the many, many sacrifices that Congressman Lewis has made in order to seek racial justice and I felt especially full of emotion in watching him. He has worked so hard and I'm so grateful that he was there to see this day. And having President Obama there to open the museum at this moment in history was amazing! 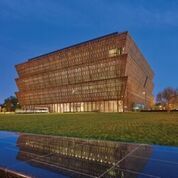 This museum is a great addition to the National Mall and even though it is The National Museum of African American History and Culture, it is a gift to all Americans. African American history is American history. And I hope that people from all walks of life in our country and from all over the world go to visit, because we all need to try to understand each other's cultures much better and how humanity is woven together strongly by the many contributions of all. There is so much venom and bigotry and misunderstanding that seems to swirl around the world daily, so I think that we really need places like this museum. We have to SEE each other for what makes us unique and beautiful and also see what we have in common as human beings. This isn't about division, it's about celebration of a culture, a beautifully rich culture. I particularly love this piece here about the museum's design. It's a beautiful building on top of being such a great place of knowledge.